Candy conglomerate Mars has yanked a Snickers ad featuring A-Team icon Mr. T from British TV after complaints that it was homophobic, reports the UK Guardian. The ad features an effeminate speedwalker who is aggressively pitied by Mr. T after he smashes through a nearby house in a pickup truck, pummeling the alleged fool with a barrage of Snickers bars fired from a truck-mounted cannon and calling him "a disgrace to the man race." 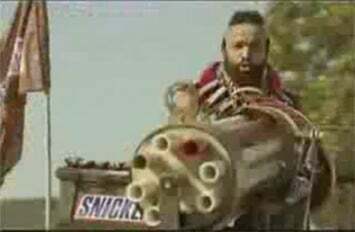 It's one a series of commercials developed by the ad agency AMV BBDO, in which Mr. T, born Lawrence Tureaud, fulminates and blusters against non-macho behavior while brandishing outlandishly phallic weaponry, followed by the slogan "Get Some Nuts." Though the ads were not controversial in the UK, they caused a flurry of complaints in America even without having yet been broadcast; the U.S.-based Human Rights Campaign protested that the ad played into "the notion that the gay, lesbian, bisexual and transgender community is a group of second-class citizens and that violence against GLBT people is not only acceptable, but humorous." No response was reported from T, but one assumes he finds the situation pitiable.